Orta San Giulio is a town and comune (municipality) in the Province of Novara in the Italian region of Piedmont, located about 100km northeast of Turin and about 40km northwest of Novara.The town itself is built on a promontory which juts out from the eastern bank of Lake Orta close to Isola San Giulio, an island which also falls within the municipal boundaries. 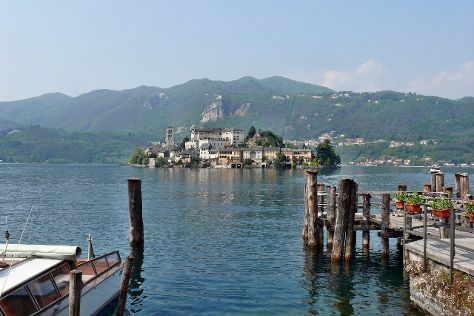 Start off your visit on the 6th (Thu): pause for some photo ops at Statue of San Carlone, then admire the striking features of Palazzo Borromeo, then take in nature's colorful creations at Villa Taranto, and finally explore the activities along Lake Orta. Get ready for a full day of sightseeing on the 7th (Fri): stroll through Safari Park and then explore the activities along San Giulio Island. For photos, maps, more things to do, and tourist information, refer to the Orta San Giulio driving holiday planning website . Turin to Orta San Giulio is an approximately 1.5-hour car ride. You can also take a train; or do a combination of train and bus. Traveling from Turin in September, you will find days in Orta San Giulio are somewhat warmer (28°C), and nights are about the same (15°C). Cap off your sightseeing on the 8th (Sat) early enough to go by car to Turin. Explore Turin's surroundings by going to Palazzina di Caccia di Stupinigi (in Stupinigi), Zoom Torino (in Cumiana) and Reggia di Venaria Reale (in Venaria Reale). There's much more to do: take in the spiritual surroundings of Basilica di Superga, see the interesting displays at Museo Nazionale dell'Automobile, admire the masterpieces at Egyptian Museum of Turin, and admire the landmark architecture of Palazzo Reale. To find photos, other places to visit, maps, and more tourist information, refer to the Turin travel route planner . Drive from Orta San Giulio to Turin in 1.5 hours. Alternatively, you can take a train; or do a combination of bus and train. While traveling from Orta San Giulio, expect a bit cooler days and about the same nights in Turin, ranging from highs of 24°C to lows of 17°C. Finish your sightseeing early on the 12th (Wed) so you can travel back home.